The Intel® Xeon® processor E5 family is at the heart of a flexible and efficient data center that meets your diverse needs. These engineering marvels are designed to deliver the best combination of performance, built-in capabilities, and cost-effectiveness. From virtualization and cloud computing to design automation or real-time financial transactions, you'll be delighted by better than ever performance. I/O latency is dramatically reduced with Intel® Integrated I/O, which helps you to eliminate data bottlenecks, streamline your operations, and increase your agility. 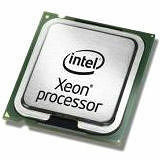 Intel® Xeon® processor E5 family-versatile processors at the heart of today's data center.